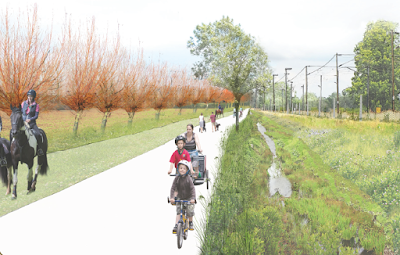 Greater Cambridge Partnership is proposing to build a new 'Greenway' route between Waterbeach and Cambridge for pedestrians, cyclists and equestrians. This is part of a wider project to build a network of 12 new Greenways to connect local villages to Cambridge. Waterbeach Cycling Campaign have met with the Greenways team several times over the past 18 months, and have provided input into the design. We are really impressed with the proposed route, and look forward to having a new route linking Waterbeach to Cambridge. More information on the scheme can be found here and here. This is currently open for consultation until Monday December 3rd 2018. We would encourage all of you to submit your comments to the scheme by filling out the online survey form or by sending an email to consultations@greatercambridge.org.uk. The Waterbeach Cycling Campaign response to this consultation is below. Please feel free to use any of the text in your personal responses. We strongly support the Waterbeach Greenways proposal, and welcome a new route to Cambridge, which will encourage more village residents to consider cycling as an everyday mode of transport. 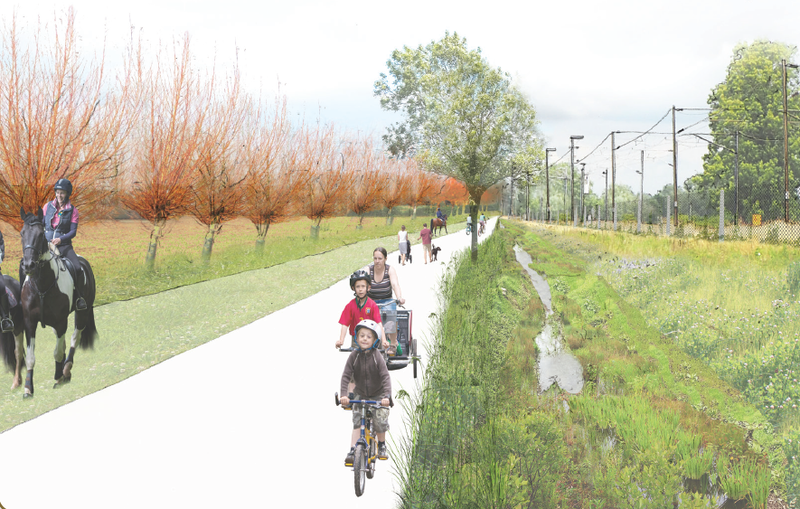 The proposal will form an extension to other cycle routes, giving Waterbeach residents the ability to link to the Guided Busway route or the Chisholm Trail without encountering traffic. The current options for cycling from Waterbeach to Cambridge are inadequate for commuter cycling (a narrow route along Hayling Way, by the river) and dangerous (a route directly alongside the A10 with traffic passing at 50mph), and the Greenway will provide a much better alternative. 1. We strongly support the route alongside the railway track – this will provide a direct route for cyclists and pedestrians to reach Cambridge away from traffic. We would like to see this route made wider (4m instead of 3m) and to be segregated rather than shared use, to improve safety for all users. A similar style of route to the proposed shared use surface can be found on the ‘DNA route’ which runs adjacent to the railway between Addenbrookes and Great Shelford. A WCC member used to live in Trumpington and noted that there was always conflict between walkers/cyclists/runners on this path, especially in the dark. The Waterbeach Greenway will ultimately be as popular as the DNA path, and we would like to avoid similar conflicts. Providing a ‘Cambridge kerb’ or similar to segregate cyclists from pedestrians would help reduce this conflict. 2. Within the village, we would like to see more done to improve Greenside, Cambridge Road and High Street to improve conditions for cyclists. · The junction between High Street and Cambridge Road is very wide, and many cars barely slow down when turning into High Street. A reduction in the width of this junction would greatly reduce speed in the area. · There are many parked cars along Greenside and High Street, which push cyclists out into the middle of the road. Removing the white lines down the middle of the carriageway and formalising the car parking into painted bays would help narrow the carriageway to reduce the speed of motor traffic and increase safety for cyclists using this route. 3. We support the proposals for Traffic Calming on Car Dyke Road, with a 20mph zone and raised table where the Greenway crosses. It will need to be made very clear to car drivers leaving and entering the village that cyclists have priority over cars. This will be a very big change to the current situation and will take some getting used to for car drivers. Having cycle priority in this situation would be groundbreaking, but we want to make sure that it is managed in a way that is safe for cyclists using the crossing. 4. We support the link along the Car Dyke, but suggest that a better route would be to follow the arable field boundary to the east side of the Car Dyke meadows. Using this route would lead to less scrub clearance (the southern end of the Car Dyke meadows is thick scrub) and would have a lower impact on the grassland habitat of Car Dyke. 5. Route A through the village is very indirect (it goes from the village, out to the A10 before coming back to the industrial estate). We don’t consider this route to be very useful for many villagers, and we suspect residents from the north of the village would cycle down High Street (Route B) to reach the Greenway rather than using this route. With improvements, this could be a better route - there is a field boundary running South from the industrial estate which may provide a more direct route in this area. If there is a limited budget for the Waterbeach Greenway, we would like to see Routes B and C prioritised over Route A. 6. We are strongly supportive of Route C, which will provide a direct link from the (consented) relocated station to the South of the village, as well as providing a direct route for new town residents to access the Greenway route to Cambridge. Residents from the Station Road area of Waterbeach will be able to access the new station quickly and easily, without having to encounter vehicular traffic. This is a really important route which will be instrumental in reducing car use within the village. 7. The A14 underpass is an important feature of the proposals, and would make the route much more direct than going via the Jane Costen cycle bridge. 8. Some people may have security concerns about cycling along the proposed Greenways route in the dark, and they may consider using the A10 cycle path as an alternative. Urban and Civic (one of the Waterbeach New Town developers) has previously proposed upgrading the A10 path. We would like to see this work carried out as well as the construction of the new Greenway, to provide an alternative route to Cambridge. Waterbeach New Town - People First Vision. 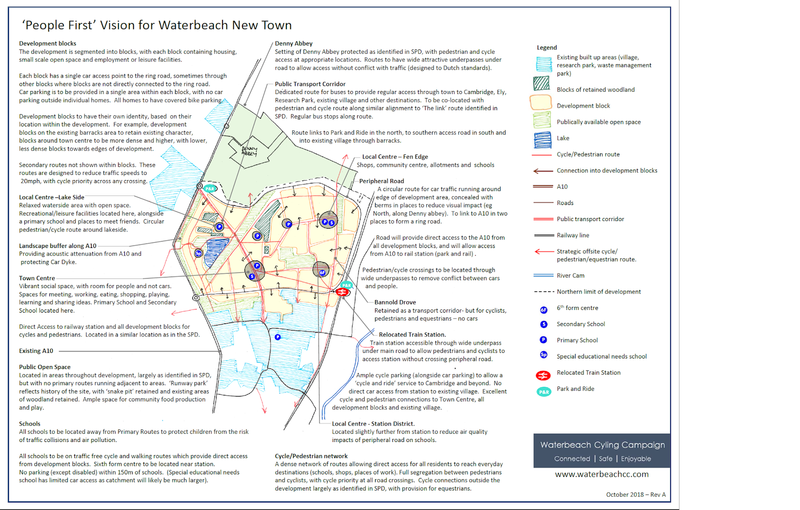 South Cambs District Council have released for consultation a document which outlines the masterplan for how the Waterbeach New Town will be developed. This document is called the 'Supplementary Planning Document' and can be found here. 26th October 2018 - 5pm. We at Waterbeach Cycle Campaign are disappointed with the vision presented in the document and have published our consultation response on a blog post published earlier in the week. We encourage you to read this and use any (or all!) of the text in your personal consultation responses. The more responses that are submitted, the more likely we are to be able to influence the plans. We have developed a new vision for the how we would like the New Town to be developed, and we have called this the "People First" Vision, as it puts the needs of people before the needs of motor vehicles. We have published this plan as a pdf on our website here and have published an explanatory document explaining the design principles we have used here. Please include these documents as attchments or links in your consultation response if you agree with our vision. Our vision is for a vibrant, thriving, healthy community, with cycling and walking used for all everyday journeys. The Foundation for Integrated Transport have recently carried out a study on new developments around the UK - titled ‘Transport for New Homes’. This study has visited over 20 large scale housing developments, looking at transport provision. The findings are stark. Many new developments are built around ‘car based living’, with a high proportion of people using cars for everyday journeys. Indeed many new towns are advertised on the basis of easy access to major roads. The report mentions ‘an almost US style of planning’ for cars in some of these developments. Many of these new development have ‘minimalist public realm dominated by the needs of the car’. There are barren streets, little room for green space and there are streets where car parking has taken over. Areas of affordable housing seem particularly hit by this trend. This can already been seen in Waterbeach – around the ‘affordable’ blocks in the new Charles Church development off Bannold Road there is very little green space, and outside space is dominated by car parking. We have fears that Waterbeach New Town will become a copy of the other developments outlined in the Transport for New Homes report if it is built as described in the consultation SPD. We live in an area which prides itself of innovation and evidence based science, and we know we can do better than this. 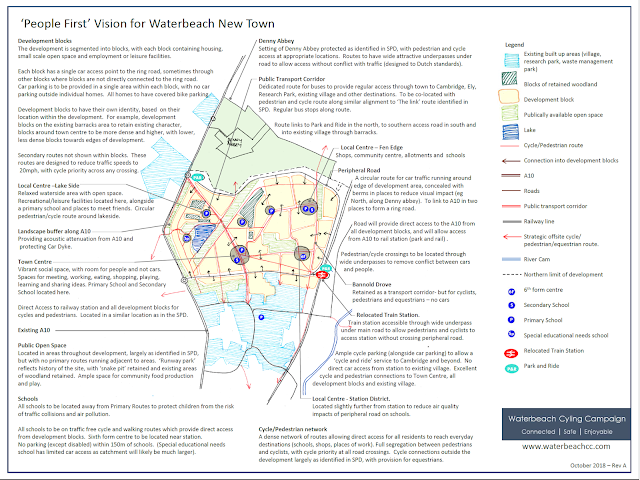 Waterbeach New Town offers an opportunity to build a development which embodies high levels of active and public transport use. We live close to Cambridge, which has the highest levels of cycling in the UK. Additionally, the area is flat. We want Waterbeach New Town to become the development with the highest level of cycling and walking in the country. It is critically important to get the design of this new development right from the outset. Developments of this nature cannot easily be rebuilt in the future – the infrastructure designed now will determine the residents travel decisions and other lifestyle choices for decades to come. This is our chance to get the design right. The People First vision is in many aspects very similar to the vision presented in the SPD. Our vision reuses a lot of the work which has been carried out to date, but with entirely different approaches to transport infrastructure. We have structured our development around existing landmarks and features (‘inherited assets’) on the site, to result in a unique town. We agree with the SPD in the identification of these features. We have loosely based our development blocks on the RLW ‘Stead’ concept. For any given trip within the new town (e.g. – from any dwelling to the local school, nearest shop, train station and leisure facilities), taking the trip by walking or cycling should always be quicker than taking the car. We recognise that some people are reliant on cars (e.g. people with disabilities, or people carrying large amounts of luggage), and do not want to make car driving around the site impossible, but we want to make sure that it is always easier and quicker to cycle or walk to common everyday destinations, such that this becomes the norm. A dense network of cycle routes provides active transportation options for everyone. A range of bikes are available for carrying children and cargo, and adaptive bikes are available for disabled people. More than a quarter of disabled people’s commutes in Cambridge are by bike. Vehicular traffic is kept on a ring road, with two connections to the A10. This road provides car access to individual development blocks, with cars able to drive to every house. Cycle and pedestrian crossings of this road are in underpasses, designed to Dutch standards given in The CROW Manual. Development is in blocks, containing housing, some employment and other facilities, each developed with their own architectural identity. These blocks are well connected to each other for cyclists and pedestrians, but only have a single point of access for motor vehicles, with each block connecting to the ring road. For a car to drive from one block to another, a trip out to the ring road and back into another block is required. Cycling and walking is quicker. For some blocks which are not directly adjacent to the ring road, vehicle traffic has to pass through another block to reach the ring road – but the same principles apply. No through routes are allowed. All development blocks are to be connected by direct segregated cycle and pedestrian routes to other development blocks, schools, local centres, the railway station and places of employment. A wider network of strategic routes provides access to Cambridge, Ely, Chittering, Lode, Cottenham and beyond. These routes should be designed with separate segregated provision for equestrians alongside cyclists and pedestrians. Cycleway design parameters should be taken from ‘Designing for Cycle Traffic’ by John Parkin (Institute of Civil Engineers Publishing, 2018) and Interim Advice Note (IAN) 195/16 by Highways England. Car parking in each block is remote from housing to make streets safer, and to make a more attractive, social public realm. Each house has covered bike parking by the street entrance. Using cycles and walking is designed to be easier than driving. A small number of blue badge car parking spaces would be made available in local centres. To make the development safe and to reduce conflict between people, cycle ways and pedestrian paths should be segregated, running parallel to each other. Cycles have priority over cars at any road crossing. To encourage fewer car journeys (and to change the mind-set of the next generation of children such that they consider cycling and walking to be the normal modes of transport), schools need to be located away from the primary street network with a ‘no parking’ zone around them. This is commonplace in Europe and is becoming more popular in UK – e.g. in Hackney This approach has considerable air quality benefits for school children both in school, and during their journeys to and from school. Studies have found that people are exposed to higher levels of air pollution inside a vehicle than those cycling or walking outside because particulates build up inside the vehicle. No cars in public spaces allows more space for people to meet in safety and without traffic noise, and more room for green spaces and wildlife. Lower levels of traffic along streets result in better connected neighbourhoods, with people forming connections with more neighbours, and people becoming less social isolated. 9. No direct vehicular access between existing village and New Town. To make walking and cycling the quickest and easiest modes of transport to get from the existing Village to the New Town, there should be no direct vehicular access between the settlements, with cars having to drive out to the A10 to get between the two settlements. There should be no access between the existing village and the New Town for construction traffic. The two settlements will be well connected with safe segregated cycle and walking routes. The design principles outlined in this section have been used with great success to develop towns in Europe which have high proportions of active transport modal share. Houten is one such example in the Netherlands which has a lot in common with Waterbeach – a small village was developed to become a New Town. Waterbeach should be developed to become its own place, not a copy of a town in the Netherlands, however the design principles used to develop this town (ring road, segmented road network, highly connected cycle/pedestrian network) has led to a vibrant community being built, with very high levels of active transport. More can be read about Houten at the here and here. If you would like to get in touch to discuss any of this further - please contact us. Waterbeach Cycling Campaign (WCC) is a community group with over 120 supporters campaigning for better infrastructure for cyclists, pedestrians and other non-motorised road users (NMUs - eg wheelchair and mobility scooter users) within and around our village. We broadly support the principle of a New Town, and support the South Cambridgeshire District Council (SCDC) vision to have a development with high levels of active transport (cycling and walking), but are concerned that the SPD does not go far enough to deliver such a development. We have major concerns with the impact that the development will have on the existing village, especially for residents in the Cody Road area. The SPD needs to be much stronger to ensure that impacts on the existing village are limited. Our concerns with the SPD, and improvements that we would like to see to the SPD are outlined below. To make this consultation response clear, we have put structured this document using the same titles as in the document, have put quotations from the SPD in red, with WCC comments and proposals for changes to the SPD in blue. We have used bold to emphasise our key objections. We are disappointed to see that the SPD is essentially a combination of the two outline planning applications which have already been submitted by the two New Town developers - Urban and Civic, and RLW. It appears as though the production of this document has been driven by these developers rather than the District Council. The vision presented by SCDC in Section 3 is commendable, but the proposals presented in the subsequent chapters do not support this vision. Section 2 - Site Context. The statement on page 17, “National Cycle Route 11 links Waterbeach railway station with Cambridge along the River Cam, with potential links to a widespread network of routes on the eastern side of the river” needs amending to acknowledge the historic issues with developing this route East of Waterbeach. We suggest adding “Attempts have been made to complete the gap in the NCN11 path, linking Waterbeach to Ely and other routes to the East, but difficulties with landowners have not made this possible”. The statement on page 17, “There is limited existing cycling infrastructure within the village or connecting into the site” is incorrect. This needs amending to say “There is no existing cycling infrastructure within the village or connecting into the site”. This section gives the vision for the development. We support much of this vision, but the SPD does not provide evidence to realise the vision. Much of this consultation response offers changes to the SPD to help improve the SPD such that the SCDC vision can be met. We fully support the aspiration for a development that is (page 29), “WELL CONNECTED - Easy to move around, in an environment where active travel and public transport are the norm.” There is little evidence in the SPD that the new town will meet this aspiration. Segregated Cycle routes built along all roads within the development will give cyclists priority through all junctions. Pedestrians will be segregated from Cyclists on all routes. This section establishes the key structuring elements of the New Town. Many of these elements will encourage a development with high levels of car use, which does not support the SCDC vision laid out in Section 3. ● Encourage existing residents to drive around the village rather than walk, cycle or use public transport. ● Increase traffic within the village, making the roads more hostile to pedestrians and cyclists. ● Reduce footfall into existing village facilities (shops, eateries). A small number of disabled only parking spaces close to the town centre (within the development) could be provided for those who have a genuine need to use cars to reach the town centre. ● Will bring additional traffic through a predominantly residential area within the existing village. Cody Road is the main route for parents and children to access Little Stars Nursery - many of whom walk and cycle. It is also used by residents of the Cody Road estate to take children to school and to walk or cycle into the rest of the village. ● Will encourage existing residents to drive to the new station rather than walk or cycle. ● Will be used as a route for villagers from Landbeach and Cottenham to drive through the village to the station as well as those from Horningsea. ● Will add more traffic to the staggered junction from Way Lane onto Cody Road. This is already busy, and a dangerous crossing to make on bicycle. Adding more traffic to this junction is not acceptable. RLW have claimed in their transport assessment that there will be no additional journeys made through the village, as traffic currently travels through the village to the existing station. Rerouting this traffic through the village to the relocated station will result in these cars passing close to the GP Surgery, Primary School and Little Stars Nursery- which leads to an unacceptable risk to the people (including children), who regularly use these facilities. Additionally, the longer (8 car) trains and large carpark proposed at the station will lead to increased use of the station and more journeys made by car, all of which will pass along Cody Road. We would like to see all traffic to the new station (including that from the existing village) to be routed through the New Town. This will help drive a modal shift from car to walking/cycling for journeys made to the station from the existing village, and will reduce traffic in the Cody Road area. Figure 17 (page 42) shows a school located at the A10 entrance of the development site. We strongly oppose this proposal. Locating a school here will encourage parents to drop children off by car, and continue to commute to their workplace by car. Additionally, the proximity of the school to the A10 will lead to elevated exposure to air pollutants for school children. To encourage fewer car journeys (and to change the mind-set of the next generation of children such that they consider cycling and walking to be the normal modes of transport), schools need to be located away from the primary street network with a ‘No parking’ zone around them. This is commonplace in Europe and is becoming more popular in UK – eg in Hackney https://www.hackney.gov.uk/school-streets and has considerable air quality benefits for school children both in school, and during their journeys to and from school. Studies have found that people are exposed to higher levels of air pollution inside a vehicle than those cycling or walking outside because particulates build up inside the vehicle. This innovative and important initiative should be used within the New Town, and be enforced through a criterion in the SPD. Figure 17 (page 42) does not have a complete key, it is unclear what the pink lines on this figure are representing. Please can you provide a complete key? The criteria for the future location and design of schools (page 43) includes "proximity to primary and secondary road network.” This is an unacceptable criterion for both active travel and air quality reasons, and will lead to high levels of car use within the development. This will make journeys by car the easiest way for parents to drop their children off at school, who then will likely continue by car to their place of employment. This clause needs removing from the SPD and replaced with a clause supporting ‘no parking zones’ around all schools as discussed above. The primary movement network is presented in Figure 18 on page 45. This shows a highly interconnected road network for cars, with routes bisecting the new town as a whole. This network will encourage car use for journeys within the development, with cars being able to make direct routes between destinations within the development. This road network will also bring external traffic through the middle of the development site. Crossing this road will discourage walking and cycling within the site. The two primary routes bisect at the town centre where there will be the highest concentration of pedestrians and cyclists. We strongly oppose these proposals, which is contrary to the SCDC vision of prioritising walking and cycling. We propose primary routes are taken around the edge of the site, with radial connections linking sectors of the development site to the primary route. Connections linking sectors of the development through the middle of the site should be limited to pedestrians, cyclists and public transport. This model has been used great effect in the Netherlands, for example the town of Houten. The primary road network for Waterbeach New Town needs to be taken back to the drawing board to make sure that the development meets the vision of a development with high levels of active transport. ● Development proposals must emphasise and prioritise sustainable patterns of movement across the New Town (see Principle 1). ● The primary street network will play a key role in the wider character and legibility of the site, as well as being key vehicle routes. Quality of the public realm and surrounding built environment is essential to creating routes which are attractive for walking, cycling and public transport, and which connect rather than divide neighbourhoods. The proposal shows a primary route through the middle of the town. Providing a “highly active area” which is “attractive for walking, cycling and public transport” is incompatible with a primary route through the area. This needs to be improved by adopting a different model, such as the Houten model mentioned above. Page 46 has a proposal that “All pedestrian and cycle routes will be direct, safe, continuous and attractive.” It would be good to expand this to include “and also be designed with strong natural surveillance to bolster personal security”. Page 46 lists a link to Chittering as a strategic walking and cycling route, but Figure 31 on Page 70 does not show this as a strategic connection. It is important that this connection is given the status of a strategic connection, with a surface suitable for all weather journeys. Residents in Chittering (which is part of Waterbeach parish) will want to access the New Town and existing village facilities, and currently have no options for cycling to the south. Page 47 states that “All pedestrian and cycle routes will be direct, safe, continuous and attractive.” How can this be the case if they are broken up by primary and secondary vehicle routes? The SPD requires firm guiding principles to make direct, safe, and attractive routes. Figure 20 on page 49 shows a “potential future additional public transport only link”. WCC are supportive of this proposal, as long as it replaces the primary road for all vehicles. This will make the New Town less interconnected for car transport. This ‘potential future’ link needs to be redefined as a ‘definite’ link, either through a trigger point mechanism or simply by making the route a public transport only route from day 1. There is no key for Figure 24 on page 54, with several different line types and colours used. Please update this figure in the final SPD. The Bounds route is discussed on page 55 –it needs to be made clear which key destinations and which “long distance walking and cycling routes” will be incorporated into this proposal, as the route seems to serve very little strategic purpose. On page 60 there is a proposal that, “Some of these proposed dwellings will use the proposed new vehicular access road serving the proposed relocated train station for their access”. WCC strongly object to this proposal. We propose that this statement is removed, and there be a clause in the SPD that “All dwellings in the New Town will be connected to the New Town road network and not the village transport network”. It is unacceptable for there to be a vehicular link between the village and the new town. Figure 29 on page 61 shows connections across the land ownership boundary on primary and secondary routes, but not cycle and pedestrian routes (only the vaguely worded “other connections”). It is important that connections across the land ownership boundary for cycle and pedestrian routes are agreed within the SPD as these will become important links through the development. These cycle and pedestrian routes must be afforded the same importance in the SPD as that given to primary/secondary road links. We foresee routes not being built, or being built in suboptimal locations unless they are agreed at this stage. Please update the figure to provide firm proposals for these connections. Table 6 on page 67 gives the land use budget for the development. This table does not include any land allocation for pedestrian/cycle paths off road. This table needs to be amended with an entry for cycle/footpaths to ensure that sufficient land is allocated from the outset for this infrastructure. Table 8 also states (page 73) - “Off-site contributions should also be sought to address the current gap on National Cycle Route 11 between Waterbeach village and south of the River Cam, which breaks up due to a missing bridge.” This is incorrect – the break is due to landowner disputes to the East of the river Cam. The reference to “Ditton Meadows” needs to be removed from this paragraph as this is several miles south of Waterbeach in Cambridge City. WCC propose the additional items to be added to Table 8 (Summary of Structuring elements (fixes). ● Provide safe and secure bike parking close to the street entrance of every dwelling, with space for at least 1 bike per bedroom, to make it as easy to get on a bike as to pick up the car keys. ● Provide safe and secure cycle parking at community, retail, school and commercial premises with all cycle parking to be adequately sheltered from the weather. ● On primary and secondary routes, provide segregation of vehicles and cycles and between cycles and pedestrians. Figure 32 on page 84 shows the primary walking and cycling routes being the same as the primary and secondary roads. On page 83, it is stated that Primary streets will include segregated cycle paths, but there is no mention of secondary streets. Cyclists and motor traffic must be segregated on all streets including secondary routes. This is important to make sure that children and other less confident cyclists use cycling as an everyday mode of transport. On page 85 is the proposal, “When the rail station is relocated, a separate access to the rail station will be created through the village to enable existing residents of the village to be able to access the station without having to go out onto the A10 and access it through the New Town.” WCC strongly oppose this proposal which must be removed from the SPD if SCDC want to achieve their vision of transportation mode shift from everyday car use to other modes of transport (page 7). On page 85 is the proposal, “Vehicular connections between the village and the new town will be restricted to public transport only. This could be enforced by the use of a bus gate or similar restriction.” To ensure that this is delivered, this measure should be a fix, not a guideline. On page 86 is the proposal “Streets which have a limited role in the movement network should be laid out to discourage through-traffic. A filtered grid of residential streets can facilitate this whilst retaining permeability and a choice of routes for pedestrians and cyclists.” To ensure that this is delivered, this measure should be a fix, not a guideline. On page 87 are proposals for mitigating impacts on the surrounding road network. These should also be fixes rather than guidelines. Page 88 states that, “In order to mitigate the impact upon the A10, the development must achieve a significant modal shift towards public transport and active travel”, and then goes on to describe the following highway improvements: “Strategic highway improvements that could include on or off line dualling of the A10 corridor, and upgrades the junctions on the corridor including Milton Interchange”, and, “Local highway improvements to mitigate development impacts at all points where capacity challenges are identified”. These two measures will achieve the opposite of modal shift, and will ensure that the development becomes car-centric. These measures should be entirely removed from the SPD. These ‘improvements’ to the road network will have an air quality impact. Developments should not be allowed where they are likely to adversely impact an Air Quality Management Area (AQMA). The closest AQMA to the development site is the A14 at Milton. It is essential that impact upon the A10 be mitigated to avoid reducing air quality within this AQMA. On page 89 is the statement, “Key cycle and bus connections to Cambridge and other key destinations should be phased at the earliest opportunity. The relocated railway station should also be provided as early in the development as possible.” This is too vague and needs to be reworded so that the measures are provided before first occupation. It is important that there is a behaviour of active transport from day one. If new residents begin using their cars for common everyday journeys because the infrastructure is not built, it will be more difficult to achieve the behavioural shift later. For any given trip within the new town (eg – from any dwelling to the local school, nearest shop, train station and leisure facilities), taking the trip by walking or cycling should always be quicker than taking the car. We recognise that some people are reliant on cars (eg people with disabilities, or people carrying large amounts of luggage), and do not want to make car driving around the site impossible, but we want to make sure that it is always easier and quicker to cycle or walk to common everyday destinations, such that this becomes the norm. Cycle and walking routes should be made to be direct rather than winding, such that cycling and walking becomes the quickest and easiest options for any trip within the development. Cycle routes should be segregated from footpaths to reduce conflict between pedestrians and cyclists. Cycleway design parameters should be taken from ‘Designing for Cycle Traffic’ by John Parkin (Institute of Civil Engineers Publishing, 2018)2 and Interim Advice Note (IAN) 195/16 by Highways England. The proposals in 6.2 – Infrastructure Delivery Plan have “trigger” points which defines when the infrastructure will be delivered. WCC have proposed some changes to certain trigger points below, such that active transport is available as an option from Day 1 for all residents of the new town. ● On page 118 are proposals for “Improved and new foot/cycleway from Waterbeach to north of city (including bridge over A10)”, with the vague trigger “To be identified through the transport assessment process”. This trigger must be changed so that this link is available pre-occupation, as new residents are likely to work in Cambridge and the current options for cycling to Cambridge are dangerous (A10 cycle route) or not suitable for commuting (Hayling Way – river path). ● It is important that the link to Cottenham (page 119) is delivered pre-occupation. This is the location of the secondary school for the development up to the point where the first secondary school will be built in the New Town (trigger point 2000 houses), which is likely to occur at around 2030. It is important that children have the opportunity to cycle to school for the first few years of the development. ● The traffic calming and improvements to junctions within Waterbeach village, on page 121 need to be delivered pre-occupation, or at least before the Train Station is relocated, as the measures will help to mitigate traffic impacts on the village from the Train Station move. ● It is important that the A10 junction (southern access) road on page 122 is delivered pre-occupation, as this will ensure that there is a link to the new station for traffic from outside the village, and will provide a route for construction traffic to access the RLW portion of the site without using the village road network. ● Direct access from the A10 to the relocated station for traffic to access the new station. Figure 34 on page 141 seems crucial to understanding the phasing of the development, but there is no key provided, and no indication of where the first houses will be located within the phase. It seems to suggest houses will be built along the primary road network, which could be a disaster for sustainable transport aspirations. More clarification is needed in this figure. We would like to see the first houses built closest to the existing village. This will help to form a joined-up community, rather than resulting in ‘us and them’ mentality if developments were separate. Building close to the existing village will also provide New Town residents with access to the existing village facilities, and will provide local shops and pubs with more business. Section 6.5 on Page 142 describes Monitoring, Review and Implementation for the development. We propose adding an ambitious target modal share by walking/cycling to the ‘Critical Areas’ listed on page 142. Houten achieves a ‘Non-motorised mode share’ of 55%, and there is no reason that Waterbeach New Town could not achieve a similar percentage. A non-motorised model share target of 50% should be added to this section, with monitoring, review and implementation actions to be carried out to ensure that this target is met. WCC are interested in being a member of the Transport Strategy Review Group mentioned on Page 145. Please could you let us know more about this group such that we can become a member in due course? There is no mention in the SPD of routing of construction traffic for the development. We have concerns that RLW will route construction traffic for their development through the existing village and along the (consented) route to the relocated train station off Cody Road. We cannot accept an SPD which allows construction traffic for the new town to be routed through the village – all construction vehicles need to be routed through the development site directly from the A10 – both for the U&C and RLW developments. We would like to organise a workshop to discuss this consultation response further. We would like our proposals to be taken seriously and the views of the community to be taken on board in this important planning document which will shape the community that we live in for the decades to come. Our contact details are below – please can you get in touch to arrange a meeting to discuss our consultation response.